Today’s post is a scan of Kujtim Buza and Kleanth Dedi’s Përmendore të Heroizmit Shqiptar [Monuments to Albanian Heroism], (Tirana: Shtëpia Qëndrore e Ushtrisë Popullore, 1973), with photographs credited to Dhimitraq Trebicka. 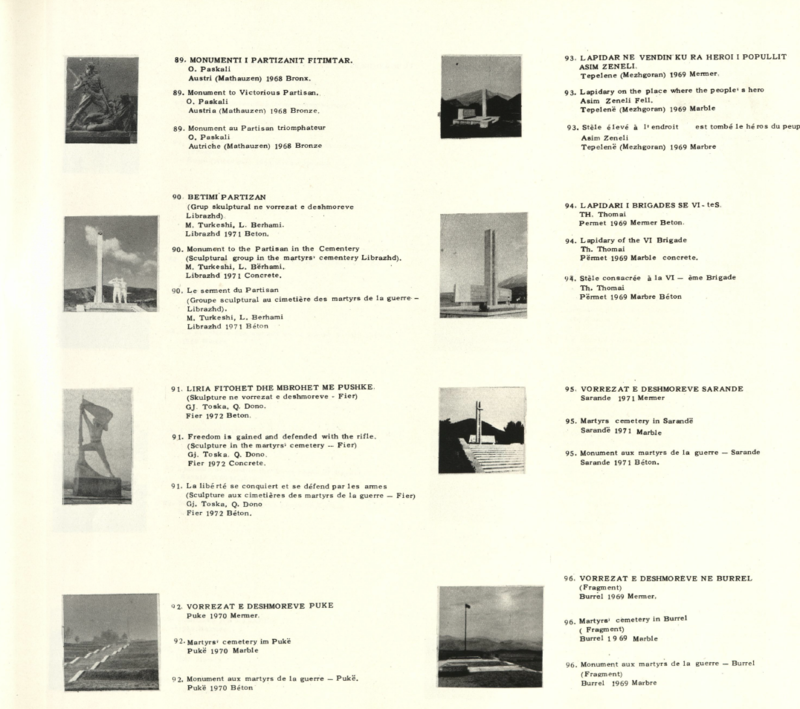 This publication presents documentation of monuments constructed in Albania through the early 1970s. Most of the monuments and memorials appearing in the book were constructed during the socialist era, although some (by sculptor Odhise Paskali) date from earlier periods. Like Mircea Grozdea’s Arta monumentală în România socialistă , Veneta Ivanova’s Българска монументална скулптура: развитие и проблеми [1978), and Juraj Baldani’s Revolucionarno Kiparstvo , Përmendore të Heroizmit Shqiptar represents a socialist nation’s viewpoint on the history and development of its own monumentality. Published in 1973, the book comes precisely at the historical moment when socialist Albania turned decidedly against ‘foreign influences’ in art and culture (after a period of openness and in some cases experimentation in the late 1960s, a period during which the country had also aligned itself ideologically with China’s cultural revolution). 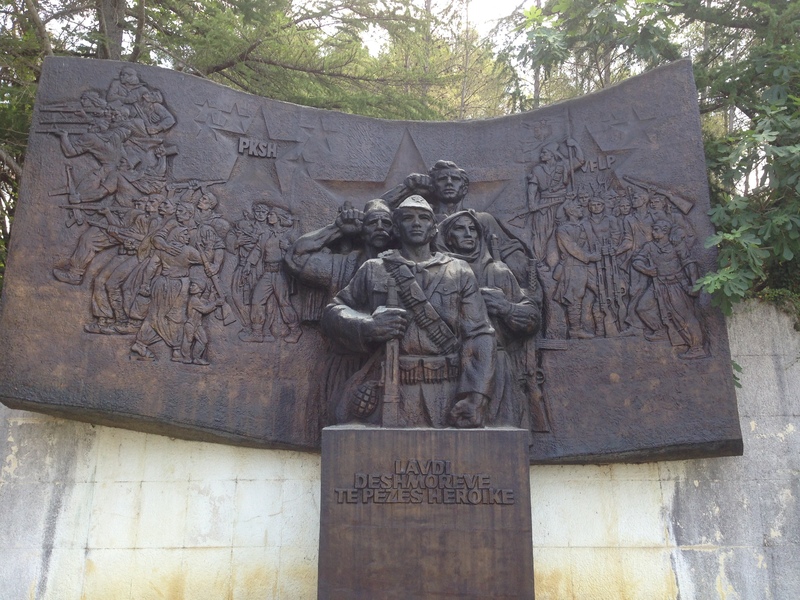 In the 1960s and 70s in particular, a huge number of monuments were constructed in Albania (in many cases to correspond to the celebration of the 25th anniversary of liberation from fascist forces, in 1969). 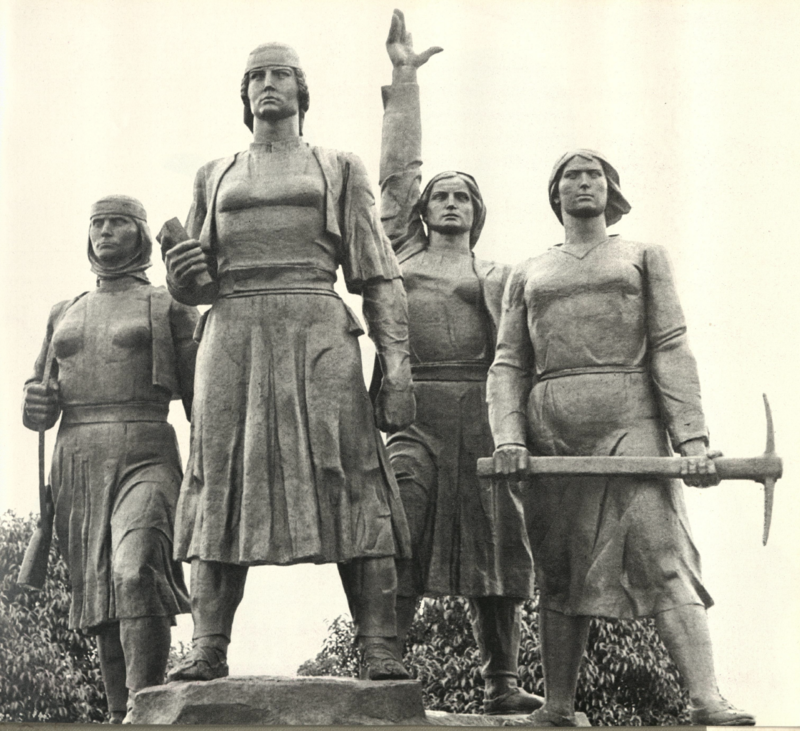 The Four Heroines of Mirdita Monument. By Fuat Dushku, Dhimo Gogollari, Andrea Mano, and Perikli Çuli. 1971, Rreshen. [now destroyed]. Relief from the Lapidar dedicated to the collectivization of land. By H. Beqiri, 1962. In Gore, Lushnja. *Unfortunately, the version of the book that I scanned was a misprint and included a section of repeated pages. Thus, some images (for example, of the martyr’s cemeteries in Librazhd and Fier) only appear as thumbnails in the back of the book, but not as full-sized photographs. At some point, I will scan these pages from another copy of the book, but for now they are not present. This text is a primarily theoretical effort to engage with Italian philosopher Gianni Vattimo’s writings on the notion of monumentality, as they are elaborated in two texts: the essay “Ornament/Monument” in The End of Modernity, and the article “Postmodernity and New Monumentality”. In particular, I want to consider the ways that Vattimo’s ‘weak monumentality’ might be helpful in considering socialist monumentality, and even more specifically how it might illuminate relationships between socialist monumentality and postsocialist monumental practices. In doing so, I seek to develop a model of weak monumentality both as a hermeneutic device (that is, as a way to approach and understand artistic practices), and as a descriptive term (that is, as a notion that actually describes certain practices at play in contemporary postsocialist art). Additionally, I seek to elaborate some of the differences between my adaptation of Vattimo’s weak monumentality and the idea of the ‘counter-monument’, but also to suggest that weak monumentality is something more specific than postmodernity’s response to modernist monumentality and its search for foundations. Although the orientation of my research is primarily concerned with the situation of post/socialist monumentality in Southeastern Europe, the ideas developed here are potentially much more broadly applicable as a theoretical framework. The history of monumentality in the modern era—and in the subsequent and decidedly amorphous eras termed ‘the postmodern’, or ‘the contemporary’—is a conflicted one, and this history certainly cannot be traced as a steady continuity, development, or decline across any span of time or geography. The very notion of monumentality suggests a timelessness or eternity that is at odds with the idea of change, and indeed of heterogeneity, and it is this apparent quality of timelessness that led Lewis Mumford to famously declare, “The notion of a modern monument is veritably a contradiction in terms. If it is a monument it is not modern, and if it is modern, it cannot be a monument.” The monument’s perceived eternal qualities, and their supposed incompatibility with modernity, however, has not necessarily led to the monument’s increased visibility (say, by contrast to the dynamism of modern life). As oft-cited as Mumford’s condemnation of the monument in modernity is Robert Musil’s assertion that “there is nothing in this world as invisible as a monument.” As Kirk Savage points out, Musil’s concern about the fundamental irrelevance of public monuments was a fairly late addition in a long history of concerns about where the memory supposedly materialized in monuments actually resides; he notes that such concerns can be traced back to Pericles’ funeral oration and the idea that the monument “planted in the heart” was more noble than the one engraved in stone. This notion has frequently found its way into postwar monumental practices; as Horst Hoheisel said of his inverted form of the Aschrott Brunnen in Kassel, “The sunken fountain is not the memorial at all. It is only history turned into a pedestal, an invitation to passersby who stand upon it to search for the memorial in their own heads. For only there is the memorial to be found” (my emphasis). The notion that memory has been displaced from the materiality of the monument, however, is not the only critique of the monument that has been made: the monument as a representative of ‘history’, according to some, evidences the dearth of memory in contemporary life, and such history even actively participates in the displacement and denial of memory. The most famous version of this argument is that put forward by Pierre Nora, in his discussion of ‘sites of memory’ (lieux de mémoire). Nora writes that “[m]useums, archives, cemeteries, festivals, anniversaries, treaties, depositions, monuments, sanctuaries, fraternal orders” are “the ultimate embodiments of a memorial consciousness that has barely survived in a historical age that calls out for memory because it has abandoned it.” These manifestations of history appear precisely because “there is no spontaneous memory” in modern society, and their appearance testifies to the fact that—according to Nora—“Memory and history, far from being synonymous, appear now to be in fundamental opposition.” Nora’s declaration that we no longer live in the time of memory but in an era of obsessive history and its production is dubious, however, at least in regards to monumentality and its paradoxical eternity and invisibility. If the public monument is truly somehow invisible—or at least if it escapes our notice—then is it really part of history’s replacement of memory? Does its invisibility, its role in the background of our experience, make it an object of memory, rather than history? Finally, are we so certain that the proliferation of history at the expense of memory still occurs today, in the period some call ‘postmodern’ and some ‘contemporary,’ and that others consider to be simply a continuation of modernity? Writing in the 1980s, Nora remarked upon a proliferation of the manifestations of what he called ‘history,’ including monuments. (Although, perhaps quite tellingly, he was not necessarily discussing a proliferation of monumentality.) Let us consider this assessment alongside that made by Italian philosopher Gianni Vattimo in the mid-1990s, when he noted the recognition of “a newly found legitimacy for monuments” in contemporary society, and a proliferation of objects (often architectural) that are considered to be monumental. For Vattimo, the context of this new legitimacy of the monumental form was in fact not modernity, but its passage into something else, and thus its context was also not strengthening of ‘history,’ but its enervation. In other words, society returned to monuments precisely in the context of “an era in which […] everything tends to flatten out at the level of contemporaneity and simultaneity, thus producing a de-historicization of experience.” Vattimo’s assessment of the turn to a particular kind of monumentality coincides broadly speaking with a particular characterization of postmodernity—one that, it should be noted, implies a different kind of ‘modernity’ than the one Nora describes. Mikhail Epstein writes of postmodernism as the inversion of the utopian dreams of the avant-garde in the earlier part of the 20th century, arguing that “[p]ostmodernism, with its aversion to utopias, inverted the signs and reached for the past, but in doing so it gave it the attributes of the future: indeterminateness, incomprehensibility, polysemy, and the ironic play of possibilities.” For Vattimo, the relatively recent rediscovery of the monument is premised precisely on its characteristic multiplicity—that is to say, its polysemy—and also on a kind of perpetual indeterminateness that might manifest itself either in obscurity or invisibility, or in our own uncertainty about its meaning. We must say that Vattimo’s understanding of ‘modernity’ is quite different from that which caused Lewis Mumford to claim that the monument was incompatible with the modern. For Vattimo, the quintessential modernity of monumentality is precisely its apparent relationship to eternity. As he writes, “to the essence of monument belongs the illusion of uniqueness and eternity, and ultimately the ambition to be a monument of foundation.” The operative word, however, is illusion: to equate the monument with eternity is to misunderstand that this association is an artificial one, an association that masks the complexity and potential dynamic multiplicity of meanings that the monument can either embody or engender. This still of course does not quite resolve the relationship of the monument to Nora’s discussion of memory and history, his assertion that “[m]emory is a perpetually actual phenomenon, a bond tying us to the eternal present; history is a representation of the past.” In fact, Nora’s memory looks something like the de-historicized simultaneity of postmodernity that Vattimo laments as ubiquitous. At the same time, Vattimo understands the new turn to monumentality not as an attempt to consolidate memory’s evasive ambiguity into history, but instead as a dissolution of modernity’s search for metaphysical foundations, an acknowledgement that the monument in fact represents something far more amorphous and ‘ungrounded’ than it might appear to. My purpose is not to engage in unraveling the sematic debates surrounding monuments, history, and memory in this corner of the extant literature, but simply to reveal at least some of the complexities surrounding monumentality between modernity and what comes after. Vattimo himself attempted to provide a kind of philosophical description of the ambiguity of monumentality in late modernism and postmodernism, and it is this attempt that I would like to build upon in the remainder of this essay. In one of the essays in Vattimo’s The End of Modernity, entitled “Ornament/Monument,” Vattimo considers one of Heidegger’s relatively lesser-known texts on art, and in particular on sculpture. This discussion develops into part of Vattimo’s broader project of discovering a mode of thinking and philosophizing after metaphysics, of discovering a ‘groundless’ mode of understanding for an era in which—thanks to the intellectual heritage of philosophers like Nietzsche and Heidegger—the transcendental and unchanging systems of metaphysics have lost their credibility for us. In his search for a new model of understanding, Vattimo turns to Heidegger’s description of truth and the work of art, and specifically to Heidegger’s spatial understanding of the occurrence of ‘truth’ in the sculptural (or architectural) monument. I would like to take this notion of ‘weak monumentality’ a bit further—and in a slightly different direction—than Vattimo takes it. First of all, I would like to transpose this theoretical category into a particular historical context, that of the transition from socialism to postsocialism in Eastern Europe. It is not, of course, that Vattimo’s philosophical move is completely ahistorical; it is, to a substantial degree rooted precisely in the historical shifts that characterize the close of the 20th century and the inception of the 21st. However, Vattimo’s history operates, as does Heidegger’s, at the scale of a history of Being (or of Being) moreso than anything else, and I should like to be a bit more geopolitically specific about the possibilities of taking up ‘weak monumentality’ as a theoretical category of artistic production. Secondly, I would like to add to Vattimo’s idea an insight that emerges from subsequent philosophies partially inspired by Vattimo’s own ‘weak thought’ or ‘weak theory’—namely, the insight into the role that affect can play in alternatives to ‘strong’ (critical or metaphysically-rooted) ontologies and epistemologies. Of course, this brief collection of observations is not meant to completely dismiss the pervasive view of socialist monumentality. This view that sees it primarily propaganda, as the attempt to consolidate an authoritarian system of beliefs and attitudes (and thus as a metaphysical structure par excellence), as the attempt to directly influence populations to follow leaders and sacrifice their lives for nation-states. All of this, undoubtedly, is true, and both history and theory have the task of understanding the function of the ideological systems that socialist monumentality played a part in. However, the characterization of socialist monumentality as pure propaganda or ideology (in the narrow sense of the words—that is, as a lie or a deception) only helps us understand so much. We also need, I think, an understanding of socialist monumentality as a weak monumentality. We need to understand the uncertainty and often the openness that characterized many of the monumental endeavors of socialism (both in its earlier and in its later years), precisely because this uncertainty often revealed the ungrounded aspects of monumentality in socialist culture. Thus, to apply the notion of weak monumentality to socialist culture is not to argue that—in some straightforwardly identifiable way—socialist monumentality was ‘weak.’ Rather, it is to apply a hermeneutic framework to this art that looks for those formal characteristics, those aspects of production and reception, those affective valences that contribute to the consolidation of a worldview only indirectly, through their dispersal, their uncertainty, and their multiplicity. In the postsocialist period, I think, the situation is slightly different. Not only can we use weak monumentality as a hermeneutic framework to pick out certain aspects of artworks and their meanings that escape our notice, but we can also use the notion of weak monumentality to name certain coherent sets of practices that artists use. Like socialist monumentality itself, the postsocialist artistic practices that engage with the issue of monumentality (either in terms of socialist heritage or in other ways) are too varied to easily summarize here. However, it is perhaps easiest to get at the idea of weakly monumental practice by considering what it is not, and among the things that weak monumentality is not is counter-monumentality. Scholar James E. Young famously uses the term “counter-monument” in his discussion of recent monumental practices in Germany devoted to the commemoration of the Holocaust. The term describes those “brazen, painfully self-conscious memorial spaces conceived to challenge the very premises of their being.” In the German context, these counter-monuments draw their self-critical aesthetic and epistemological skepticism not only from a general suspicion about the ways monuments can obscure history as much as reveal it, but also from a concern about the ways Nazi culture embraced the monumental. In the postsocialist context, there is certainly a similar turn against the perceived deceptions of socialist (monumental) history (as well as against official commemorative practices after socialism). However, with the use of the term ‘weak monumentality’ as opposed to ‘counter-monument/ality,’ I intend to make an important semantic and conceptual distinction. The practices that I would describe as ‘weak monumentality’ or as ‘weakly monumental’ are not explicitly conceived to “challenge the very premises of their [own] being,” or of the monument’s being. In fact, their relationship to this avant-garde or modernist position of (self-)criticality is highly ambivalent—they do not necessarily aim at the deconstruction of their own medium, nor at the critique of their own institutions. I should note that I do not conceive of ‘weak monumentality’ as somehow starkly separated from ‘counter-monumentality,’ and it is clear that some works produced in postsocialism clearly could be helpfully discussed within the framework of the counter-monumental. However, the counter-monument—in its criticism of the premises of the monument/al—attributes a certain metaphysical primacy and wholeness to the monument (as something that can then be undermined). By contrast, the weakly monumental (as I develop it following Vattimo’s conceptualization), is committed neither to the metaphysical primacy of the monument nor to that of (counter-)memory. Instead, it disperses the monument, allowing it to remain a background for experience, and precisely in allowing it to remain in the background (as opposed to bringing it forward for criticism) it allows it to be preserved in a particular way. Weakly monumental works function much more frequently as continuations, adaptations, or supplements to the monument and to monumentality. More specifically, they care for monumentality; they are as likely to criticize the monument’s absence or its degradation, as they are their own premises and aesthetic possibilities. Furthermore, they often take up socialist monumentality in a way that is neither wholly passive nor entirely critical, they both resist the demonization of the socialist era sometimes promoted by postsocialist governments and model new forms of both heritage preservation and historical discourse. When they take up the subject of official contemporary (that is, official postsocialist) monumentality, they do not necessarily do so from the point of view of an ideologically or metaphysically uniform or consolidated position. Rather, they are suspicious enough of official monumentality to seek an alternative mode of commemoration, but susceptible enough to the affective forces of both memory and history to avoid the urge to deconstruct them. In his discussion of postmodernity and the ‘new monumentality’ (that is, the newfound legitimacy of monumentality at the close of the 20th century), Vattimo writes that monumentality “is always already based on a ‘former’ monumentality; it does not remember an event, a person, or a value, but only a memory, which it turns into monument insofar as it is a memory actually shared by a community that recognizes itself in it.” This is perhaps the most salient characteristic of ‘weak monumentality’ in postsocialism: it is indebted to forms of monumentality that come before it, and it recognizes this debt in its own forms. It does not seek to overcome its predecessors through critique or transcendence, but to live with them, to occupy their time as well as its own. We might consider here the myriad photographic projects undertaken to document the current state of socialist monuments (and the relationship of these projects not only to art history but also to heritage studies). We might consider the performative projects that seek to recuperate monuments, to care for them, to renew their meanings—and to add something to them. We might consider the playful treatments of the archive in relation monuments, the proliferation of reproduced images of monuments not in order to exhaust them but in order to preserve them as ideas in an era without foundations. We might also consider those official commissions that essentially reproduce the formal language of socialist culture, but without a coherent project to reinstate that culture. We might consider recent returns to styles that once engendered only suspicion and critique, such as Socialist Realism, with an eye towards their emotional possibilities rather than their ideological dangers. It is in this curious collection of projects that we might distinguish something like a weakly monumental postsocialist practice. Gianni Vattimo, The End of Modernity, trans. Jon R. Snyder (Baltimore: Johns Hopkins University Press, 1991), and Gianni Vattimo, “Postmodernity and New Monumentality,” RES: Anthropology and Aesthetics 28 (Autumn, 1995): pp. 39-46. Lewis Mumford, The Culture of Cities (New York: Harcourt, Brace, Jovanovich, 1938), p. 438, qtd. in James E. Young, “Memory and Counter-Memory,” Harvard Design Magazine 9 (Fall, 1999), http://www.harvarddesignmagazine.org/issues/9/memory-and-counter-memory (accessed 5 July 2016). Mumford was, of course, speaking in the context of the development of the city, which leaves open the question of the rural monument (and thus also the question of ‘modern’ existing outside the urban environment). Robert Musil, “Monuments,” in Posthumous Papers of a Living Author, trans. Peter Wortsman (Hygiene, Colorado: Eridanos Press, 1987), p. 61, qtd. in Kirk Savage, “The Past in the Present,” Harvard Design Magazine 9 (Fall, 1999), http://www.harvarddesignmagazine.org/issues/9/the-past-in-the-present (accessed 5 July 2016). Pierre Nora, “Between Memory and History: Les Lieux de Memoire,” trans. Marc Rousebush, Representations 26 (1989), p. 12. Vattimo, “Postmodernity and New Monumentality,” pp. 39-40. Vattimo, “Introduction,” in The End of Modernity, trans. Jon R. Snyder (Baltimore: Johns Hopkins University Press, 1991), p. 10. Mikhail Epstein, After the Future: The Paradoxes of Postmodernism and Contemporary Russian Culture, trans. Anesa Pogacar (Amherst: University of Massachusetts Press, 1995), p. 330. Vattimo, “Postmodernity and New Monumentality,” p. 44. Nora, “Between Memory and History,” p. 8. Although I do believe that a consideration of the points of contact and divergence between Nora and Vattimo—perhaps mediated by Ricoeur’s hermeneutic discussions—would be a productive one for historians, philosophers, and aestheticians alike. The text is “Art and Space,” trans. Charles H. Seibert, Continental Philosophy Review 6:1 (1973): pp. 3-8. Qtd. in Heidegger, “Art and Space,” p. 8. Part of this, of course, might be attributed to the very ‘de-historicization of experience’ that at least sometimes characterizes our present. Shaban Hadëri, “Monumentaliteti i Jetës Sonë dhe Pasqyrimi i Tij në Skulpturë,” Nëntori 24:5 (May 1977), p. 246. Muntas Dhrami, “Vendosja në Hapësirë dhe Përmasat Kanë Shumë Rëndësi,” Nëntori 4 (April, 1976): p. 23. Andon Kuqali, “skulptura Monumentale dhe Disa Probleme të Saj,” Drita 13 December 1977. We must also acknowledge that in many cases, the artists who produced works of monumental sculpture under socialism essentially belonged to an elite class. Among other things, we must question exactly what was ‘socialist’ about this monumentality. To discuss socialist monumentality from the viewpoint of weak monumentality means not treating socialism as a monolithic power structure, but instead as a set of practices, aesthetics, and affects that were sometimes active and sometimes passive in the way that they shaped socialist citizens. This also means that we must pay all the more attention to categories that—in some socialist states, at least—were considered to be ideologically ‘neutral.’ (A great deal of public sculpture in the Czech Republic in the Normalization era might fit into this category, for example, or the skulptura e parkut [park sculpture] produced in socialist Albania in the final two decades of Enver Hoxha’s regime.) These works are interesting from the viewpoint of weak monumentality not because they somehow ‘escape’ ideology, nor because they show that ideology was still present even in the most mundane artworks; rather, they are interesting because they can show the complexities of establishing what monumentality (and socialism) was. They can show us that socialist monumentality was not a straightforward project, but a meandering navigation of spaces, emotions, and aesthetic forms. The question of so-called ‘late socialism’ (typically used to describe the period, especially post-1960s, after which many nations had broken direct ties with the Soviet Union) is particularly interesting, since critics often describe it as a period in which regimes no longer believed in the project of socialism, yet continued to perpetuate its forms. (see, for a paradigmatic example of this assessment, Aleš Erjavec’s introduction to Postmodernism and the Postsocialist Condition: Politicized Art Under Late Socialism (Berkeley: University of California Press, 2003). Frequently, these critical models advocate attention to ‘nonconformist’ art in this period, assuming that regimes’ lack of conviction in the socialist project made their ‘official’ art uninteresting. However, I argue that official art in these years can be just as productive to examine, precisely because (although for very different reasons than ‘unoffical’ art) it also gave up the belief in its own metaphysical security and its attempt to construct solid foundations. Its loss of convictions was also parallel to that experienced in more ‘countercultural’ modes of artistic production, and thus there is no reason to privilege the study of one over the other. James E. Young, “The Counter-Monument: Memory against Itself in Germany Today,” Critical Inquiry 18:2 (Winter, 1992), p. 271. Part of the very character of the weakly monumental, I think, is that it is not starkly opposed to anything as a category, and yet at the same time it is also not ideologically neutral. Vattimo, “Postmodernity and New Monumentality,” p. 45.